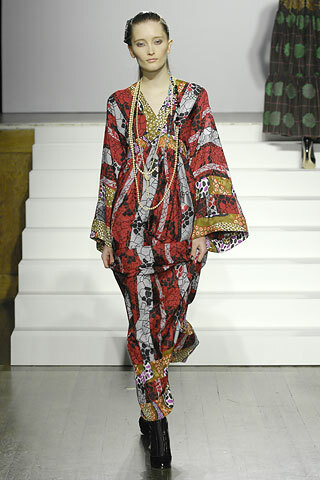 Madelene (and several other folks, but I think Madelene was first) linked me to the Style.com coverage of Duro Olowu's recent London show. There were lots of gorgeous fabrics and some really lovely coats, but this was the only dress close to the iconic "Duro"-type. I like the longer sleeves and the longer length — I think this is great as an evening gown, very easy and comfortable yet glamorous, too (and for a shortish person I'm unfortunately enamored of maxi-length dresses). I also like the double-banding (it looks like) on the sleeves and at the hem. The whole show is worth checking out … I really wish I needed one of those coats. I mean, I *want* one of his coats; I just don't need it. Oh come on, we ALL know that WANT = NEED! I love the length of it, too.I’m just under 5’5″ and I wear long all the time (when I wear dresses or skirts, that is) and I don’t care what people think. Actually, I get lots of people coming up to me to say they love seeing someone with the courage to wear what she wants to. So my conclusion is, we should wear whatever we want to, regardless of anyone else’s “rules” or (unsolicited) opinions. And if that means we happen to be into relating (through) what we wear to a current fashion scene, then that’s great, too! Why not!? None of it’s anyone else’s business.It’s all there to enjoy, or to look past. Whatever!Whew, I love that new Duro dress, the more I think of it. Theresa, I didn’t see it, but you’re very welcome – I gather the information was helpful?Erin and Rebecca, First of all, Erin, you’re not that short. Second of all, I give a heaping helping of Pshaw! followed with PIFFLE! as to the Maxi maxim. Look at museum collections, look in fashion histories, look at women in Japan: there is plenty of evidence of women who were short, and women who are short – sometimes very very short – wearing “maxi” length skirts and dresses, and looking very fine indeed. While it’s not true that “they were all so much shorter back then,” it is certainly true that there were short women. And since long skirts/dresses were what virtually all women were wearing, long skirts/dresses were what short women, tall women, thin women, fat women, young women, old women, pregnant women, etc., wore. A couple of the (floor length) dresses in the Regency section of Nancy Bradfield’s Costume in Detail are specifically described as made for wearers who were “short” and “stout.” If ever a style might be thought to be intended for the young, tall and willowy, one might think of Regency dresses that way. Yet here is evidence that they were also worn by the short, the stout, and, very likely, the not-so-young – and the dresses are charming, and probably looked wonderful on the wearers.Wear maxi skirts, if that’s what appeals to you! And what is this “need” of which you speak? I reckon once the basics are covered, and you can go to work without catching a deathly chill or incurring a dire sunburn, “want” has more to do with a wardrobe than “need.” Go for true love, rather than the marriage of convenience!Also: What Oracle said. la belladonna, I just added a post responding to something you’d said to me at the end of the thread of Erin’s “A Good Woman Praises Her Tools” blog of March 7. It made more sense posting it there than adding it here. Yes, agreed . . . wear maxi if you want to. If you feel good in it, you’ll look good in it. Mind over matter.However, I must draw the line at micro-minis. Not appropos on anyone. I always believed that long unbroken line makes you look taller. Who gave the fashion police their badges anyway? Half the time the people who are saying everyone looks so awful or are wearing the wrong thing aren’t looking to fabulous anyway. Wear what makes you happy. Life is to short to not wear maxi skirts/dresses! Well, amen and all right! No more apologizing for my lengthy skirts and pshaw and piffle to the F.P. I love that Duro Olowu dress – it makes me want to sit and drink cocktails with friends. Imagine how glamorous all one’s hand gestures would look! could this blog be any cooler? no it could not. McCalls does make a knock-off of the Duro style dress. Pattern #5137http://www.mccallpattern.com/item/M5137.htmOh, and if you’re a sale girl, JoAnn Fabrics will have their McCalls patterns on sale for $1.99 this Thursday – Saturday. Happy hunting! Thought I left a comment here; oh well, lost, I guess.Erin, I saw in a magazine* that the word of the year was plutoed. Maybe, poor Pluto, we can all figure out what that means. But for me, and I suspect many here, the word of the year was Duro.MinaW*Which magazine? Haven’t a clue. I was checking them in at the library. Could have been anything. Just under 5’5″? And you think that is short?! I’m grown and only 5’0″ and believe me, there are some things you just don’t wear, that is if you want to look decent.